Home»Hiring A Contractor»Why Pick A Basement Expert? Often, the choice is clear when you’re looking for someone to work in your home: a plumber fixes your shower, an electrician will add a light switch, and so on. In other situations, it might seem that one contractor is as good as another. An experienced basement remodeler will have years of creatively working with these challenges to help you make the basement look exactly the way you want it to. They'll also be familiar with Illinois building codes and standards, and they'll be familiar with the best practices in the industry. A finished basement is going to look different than the rest of the home. Basements have more obstacles, fewer windows, and usually a lower ceiling than the rest of the home. Any contractor will want the design to be consistent with the upper levels, but an experienced basement finisher will know how to take advantage of lighting and basement windows to make the most of your space. 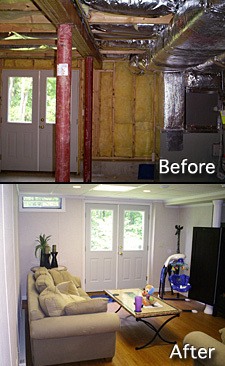 A fiberglass and fabric basement wall damaged by moisture. The environment of a basement requires different building materials than the rest of the home. Unfortunately, general contractors will often still insist on installing drywall for the walls and ceilings while placing a carpet on the floor- just like they do in the rest of the home. This leads to a problem that Illinois has seen by the dozens- moldy drywall, sagging ceilings, musty smells, and ruined remodeling jobs installed by well-intentioned general contractors that just don’t see the long-term effects of installing with these options. For example, general contractors will often install carpeting on top of a wood subfloor on the concrete basement floor. This installation will take 3-4" of head room from the homeowner’s area. Additionally, when wood boards are laid on a basement floor, they will collect moisture and humidity that seeps upwards from the porous concrete below. 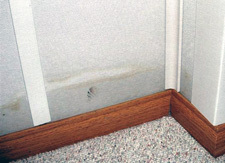 This moisture will cause the wood to rot, swell, buckle, grow mold, and emit foul odors. The damage will eventually spread to the carpet, ruining the finished floor. And drywall, even mold-resistant drywall (which has no lasting warranty against mold), will also grow mold and be easily damaged by any moisture or leaking. Experienced basement contractors such as Total Basement Finishing will be able to provide you with the lasting solution you’re looking for. Using well-insulated, completely organic materials that include a long-lasting written warranty, the basements they install will stay beautiful for many decades, without needing to be refinished. General contractors do not make a living finishing basements. Simply put, any estimates on materials needed, price, or time needed to install your finished basement are going to be rough. Expect at least a 10% cost overrun by the end of the installation. Additionally, general contractors will tightly schedule their work. If they’ve underestimated the time they need, they may have to return at a later date to complete the job. This leaves the homeowner with a house fill of displaced belongings while they wait for the contractor to return. Lastly, the Small Business Administration reports that 50% of contractors fail within the first year and 96% within the first five years. If you hire a contractor who is not well-established in the industry, there's a solid chance that they won’t be in business anymore when you need them. And a warranty can't last if the company is no longer there, right? 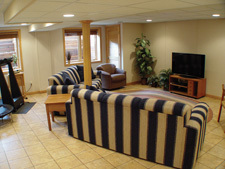 Total Basement Finishing has been specializing in basement remodeling projects since the early 90's, and we have the experience, lasting products, and reputation you need to feel confident that you've picked the best basement finishers for the job. You can count on solid pricing that won't rise by the end of the job, the best basement finishing plan, and a job done at the scheduled time. We serves Illinois in areas surrounding Aurora, Naperville, Joliet, Schaumburg, Elgin, Des Plaines, Cicero, Arlington Heights, Bartlett, Palatine, Kenilworth, Glencoe, Eola, Winnetka, Hoffman Estates, Barrington, Wheaton, Berwyn, Orland Park, Skokie, Downers Grove, Tinley Park, Mount Prospect, Boilingbrook, Oak Lawn, Oak Park, Lombard, Glenview, Saint Charles, Lockport, Elmhurst, Melrose Park, Plainfield, Carl Stream, Elmwood Park, Dekalb, Evanston, Northbrook. For a FREE basement finishing quote by one of our company's certified, highly trained licensed specialists, call or e-mail us today!